President David Granger will shortly announce a date for General and Regional Elections but from all indications it will likely be nearer to the end of the year. The Opposition in a quick-fire response yesterday, in the middle of the Phagwah celebrations, said that it is totally unacceptable. On Wednesday, Minister of State, Joseph Harmon wrote Leader of the Opposition, Bharrat Jagdeo, informing him that the President is preparing to announce the date. 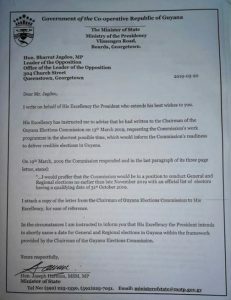 The letter suggested that Granger would be likely veering for what Chairman of the Guyana Elections Commission (GECOM), Justice (Ret’d) James Patterson informed him this week- that based on the fact that house-to-house registration will take some time, no elections can be held before late November. 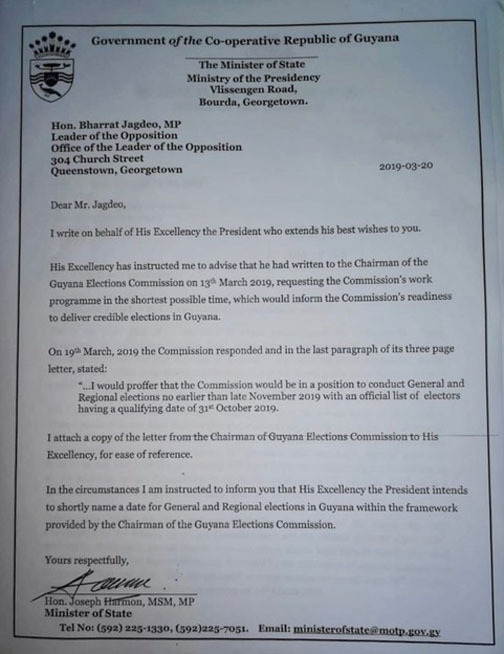 The response from the GECOM chairman came after the Head of State wrote him, asking him to produce the commission’s work programme and to inform of the readiness to deliver “credible” elections in Guyana. Giving an indication of the president’s thinking, Harmon, in the released letter sent to Jagdeo, said that the president’s announcement of a date would be within the context of what the GECOM’s chairman has provided in his answer. However, the Opposition Leader, yesterday responded that he has carefully perused the content of the letter, more particularly the final paragraph which says that President Granger will shortly name a date for elections within the framework provided by the Chairman of GECOM. Jagdeo said that he has already expressed his views on the “framework provided by the Chairman of the Guyana Elections Commission” — one that includes national House-to-House Registration and General and Regional Elections in “late” November 2019. The Coalition Government and the president have been insisting that they cannot call elections without being advised by the “independent” GECOM. A major political situation has been ongoing since December 21, when a no-confidence motion by the Leader of the Opposition was carried in the National Assembly. This was after a parliamentarian for the Coalition Government, Charrandass Persaud, joined with the Opposition to say yes to the motion. It triggered elections, as catered for under the Constitution of Guyana, to be held within 90 days. That 90 days, according to the Opposition, ended yesterday. With no parliamentary decision to extend the life of the Government, Guyana is in no man’s land. Government has been questioning the legality of the vote. It first took it to floors of the National Assembly where Speaker of the House, Dr. Barton Scotland said it was properly carried. Then it was taken to the High Court where Chief Justice (ag), Roxane George, in her opinion, said that the vote was carried. It was then taken to the Court of Appeal where decisions are expected to be announced today. Both sides have indicated that they are prepared to take the matter right up to the Caribbean Court of Justice, the final judicial review process. With Guyana about to start producing oil in a matter of months, there is much at stake. It was said to be the biggest oil find in years with operator ExxonMobil and its partners fast-tracking development of the oil-field. In Guyana, the issue has heavily divided a nation in what is revving up to be the mother of all elections. Leading the charge for the Opposition is former president under the People’s Progressive Party/Civic, Bharrat Jagdeo, who came out of retirement to revive the fortunes of a party that lost elections in 2015 after 23 years of continuous reign. The international community, worried by the impact of the political fallouts, has been urging that a solution be found soonest. The Carter Centre, which brokered the conditions for the 1992 elections which saw the People’s National Congress losing after 28 years in power, is here again attempting to broker an arrangement where elections can be held soonest. 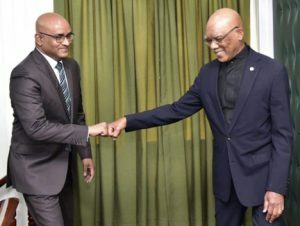 Jagdeo has been appealing for the international community to place sanctions on the Granger-led coalition to force elections. However, there has yet to be a definitive statement in which the Government has activated what it says is its right to have a judicial review of a flawed vote. The Opposition has accused GECOM of colluding with the Government to stall elections, an accusation that has been denied. GECOM itself, comprising six commissioners- three from each side along with the chairman- has been divided. Government commissioners have been insisting on house-to-house registration, which could take months, to sanitise the list. The Opposition, on the other hand, has been objecting to any such exercise, saying that there are other ways to sanitise the list and to register new voters. In any case, there is no provision that dictates that a house-to-house exercise must be held, the opposition contends.